A single brand of antique shotgun, the Parker, has provided enough work for a family of gunsmiths for four generations, even though it was discontinued more than 70 years ago. "It's an honor to work on these guns," said Larry DelGrego III, whose great-grandfather, Herman Shura, emigrated from Germany in the early 1900s to begin the family tradition of working on Parker shotguns. "I'm very fortunate that this is something I was born into." The Parker is a specific brand of break-action shotgun that has a fervent following among hunters and collectors. The cheapest model, the "Trojan," goes for $2,000, while the rarest make is the "Invincible." Only three of them were ever made, and together are valued at $5 million. One Invincible was refurbished by DelGrego III's father, "Babe" DelGrego Jr., who worked on the guns until 1993. A Parker that's worth $110,000 will cost about $6,000 to refurbish at DelGrego's shop. But he'll charge $2,500 to spruce up a more run-of-the-mill model. Charles Parker of Meriden, Conn., developed the gun in 1865, as the muzzle-loaders of the Civil War gave way to more advanced breech-loading technology. Shura was hired by him first, and Shura's son, Lawrence DelGrego Sr., started working for the Parker company in 1933. He moved when Remington bought the company five years later to Ilion, N.Y., where Remington still has a gun factory. Remington stopped making Parkers in 1942, when supplying arms to the military to fight World War II took precedence over shotguns used for hunting. But the DelGregos kept fixing, maintaining and refinishing the guns. 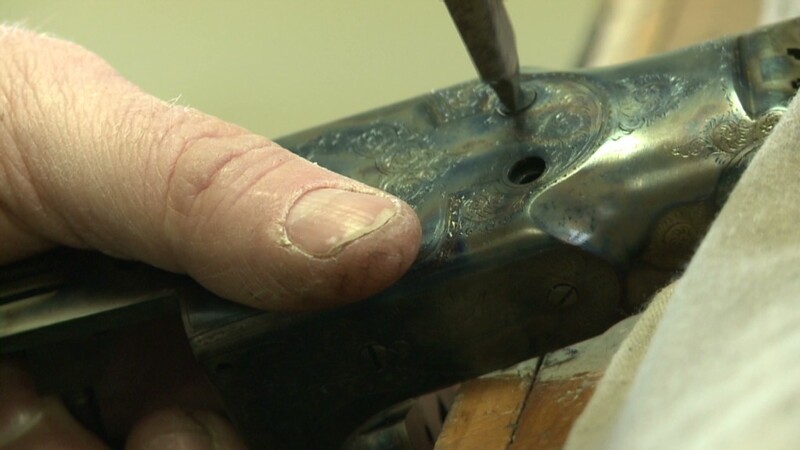 The work they do includes rebuilding a gun's stocks, hardening the frame, blueing the trigger and rebrowning, reboring and repolishing the barrels. DelGrego III said it takes about 50 hours to refinish a gun, and he typically works on eight at a time. "When the gun leaves here, it's exactly the way it was when it left the Parker factory," said DelGrego, as he worked to removed "100 years of hunting and shooting dirt" from an antique firearm. DelGrego said his business brings in about $120,000 per year. After expenses he takes home from $30,000 to $50,000 per year, a decent living in this part of upstate New York. More than 242,000 Parkers were produced during the shotgun's 77-year history. DelGrego says his family has refurbished more than 60,000 of them so far. DelGrego III's shop is still about a mile from the Remington Arms plant, which was established in Ilion in 1816. He estimates there are at least 40,000 Parkers still in existence that his family has yet to refurbish. Some of that work might fall to the next generation. His college-aged sons and teenaged daughter have accompanied him in the shop, just as he used to accompany his father. "They're going to college first," he said, but he doesn't know if there will be a fifth generation gunsmith after he's gone. "I won't retire," DelGrego said. "I'll work until I'm dead, and they'll worry about it then, I guess."